People born with Scorpio on the ascendant are controlled, loyal and although they may seem outgoing, will likely be keeping some things hidden. This constellation is expert at keeping secrets and maintaining privacy. It’s not a great wonder that Scorpio rising people suit powerful positions in politics… Hilary Clinton, Margaret Thatcher, Jackie Kennedy, Grace Kelly and Imelda Marcos all have the Scorpion rising in their birth charts, maintaining a public air that’s still; calm waters clearly win out (no matter what’s stirring underneath…). With Scorpio rising your chart ruler is Pluto, planet of powerful transformation. Depending on where Pluto falls in your chart and how it’s aspected will reveal even more about your character and your Star Sign Style! With Pluto ruling the chart you can count on Scorpio rising people being powerful, determined and strong willed. 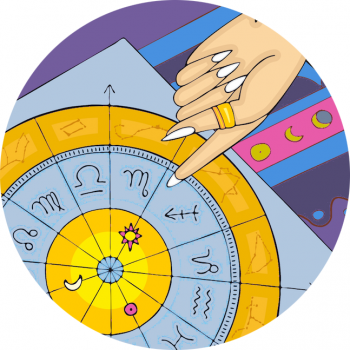 Slow to move, they’re consistent, persistent, and as a fixed sign, Scorpio rising has real staying power. Read Scorpio, Mesmerising In Maroon. They might don a turtleneck, or oversized shades – so no-one sees them in the shadows! Scorpio is also known as the eagle in myth and legend, and true to the aesthetic of this strong bird, the appearance of Scorpio is to have hooded or heavy-lidded eyes and a beaked look to the nose. They can be muscular or look strong and stealthy, they may have a seductive, powerful, penetrating presence about them, even a walk that’s magnetic. Their steely glare that susses out any situation before stealthily making a move.